Kuih Talam recipe. Kuih talam (tray cake) is a kueh consisting of two layers. 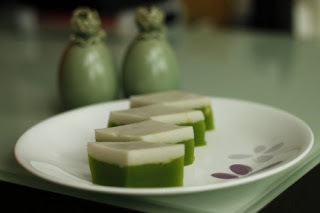 Ingredients made with wet rice flour, sago flour, alkaline water, coconut milk and pandan leaves. To prepare green layer. Mix rice flour, sago flour and sugar with coconut milk. Add remaining ingredients. Pour mixture into a lightly greased tray and steam for about 1 hour. To prepare white layer. Mix all white layer ingredients. Stir well till blended. Pour mixture over green layer. Steam another 30 min. till layer sets. Check out these food steamers . Allow to cool completely before cutting into diamond shapes. Serve.